No, out-of-state owners/landlords are not required to have a local property manager, but out-of-state owners/landlords must have an in-state statutory agent, which is different. A property manager manages the property, collects rent, etc., whereas a statutory agent merely receives notices and legal service of process on behalf of the owner. If an out-of-state owner/landlord fails to have a statutory agent, the owner/landlord is subject to substantial statutory fines and this is also legal grounds for a tenant to terminate an existing lease. An out-of-state owner must have an in-state statutory agent. And, as a practical matter, it makes sense to have a local property manager because s/he can be more responsive to complaints, etc. Also, if there is an eviction, the local manager can provide testimony about the relevant facts, otherwise the out-of-state owner will need to personally appear to give testimony. 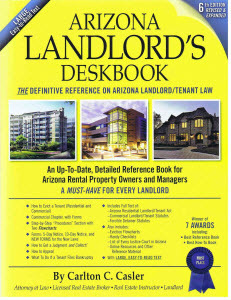 If there is no statutory agent information (i.e., name and mailing address) provided in a residential lease agreement, does that constitute legal grounds for a tenant to terminate an existing lease when the premises have gone into default on a Trust Deed / a Trustee Sale date has been set with 90 day notice given, and notice posted on the property? Response by Carlton C. Casler. Yes, ARS Sec. 33-1902(A) requires all people (and business entities) who own residential property to register with the county assessor (the county in which the property is located). In addition, ARS Sec. 33-1902(B) requires owners (and foreign business entities) who do not live in Arizona to also have an in-state statutory agent. Foreclosure of a rental property is an entirely separate issue. If the rental agreement states that commencement of a foreclosure is a breach by the landlord (or words to that effect), then that is a breach and the tenant may serve a ten-day notice of material noncompliance and vacate if the breach is not cured.